Situated in the heart of Midtown, Kristalbelli combines upscale dining with Korean barbecue – a truly unique experience that was only enhanced by Restaurant Week pricing. Arriving for our reservation at 7pm on a Friday night, we were greeted by two friendly, formally dressed hostesses. Seated right away, we were in the center of the dimly lit dining room and surrounded by two other parties. Although the group next to us was quite large, the tables were positioned just far enough as to not let their conversation overpower ours. Approached almost instantaneously by our waiter, we were presented with the task of choosing the dishes for our prix fixe meal. Starting with the appetizer, the three of us remained uniform in choosing the Truffle Tteok and Cheese. Although it was a dish that felt more Italian than Korean barbecue, it didn’t disappoint. Complimented by my favorite (white truffle oil) and made of rice gnocchi and cheese, I was in food heaven – and after a few bites, already pretty full. As soon as we signaled to our waiter we had finished our appetizers, another member of the wait staff was already bringing out our entrées. Ordering the Kristal Bibimbap, the dish wasn’t anything to brag about. Don’t get me wrong – the dish was still very tasty and the chili pepper paste tied the vegetables, beef, and rice together nicely, but I wasn’t overly impressed. In hindsight, I wish I had chosen to go with the Wagyu Ribeye for the full Korean barbecue experience. 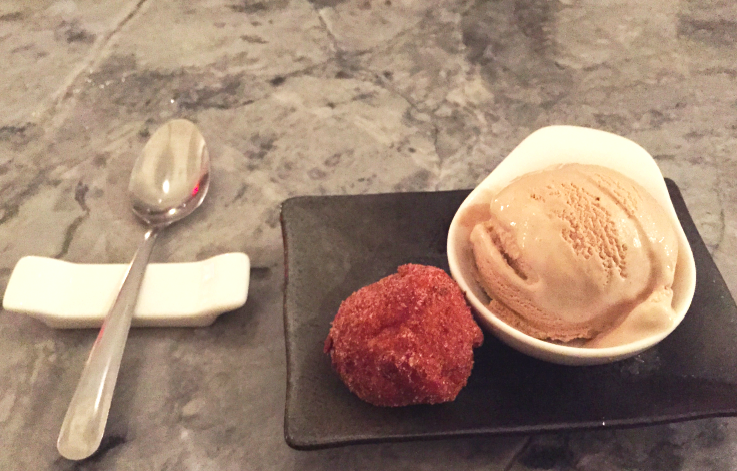 Wrapping up our entrées, the three of us opted for the espresso-flavored gelato accompanied by a cinnamon sugar donut. While the donut was subpar in flavor and freshness, the gelato was to die for. With subtle hints of espresso that didn’t overpower the overall taste, the dessert was definitely one of my favorite parts of the dining experience. Not only was the food delicious and the price for it a steal, the wait staff was extremely attentive without interrupting the flow of our conversation. Whether it’s a girl’s night out or a romantic date, Kristalbelli provides an intimate setting with incredible food and service – a restaurant you truly can’t go wrong with.